Official artwork of the Red Bulborb. Red Bulborbs (アカチャッピー, Red Chappy) are enemies from the Pikmin series. A Red Bulborb in Pikmin 3, getting hit on the eye. Bulborbs appear in all Pikmin games, and are one of the Pikmin's most common predators. They populate the Distant Planet, and are found in almost every area at dusk and day. They attack Pikmin by devouring them. They can be killed with large amounts of Pikmin attacking them from behind and their dead bodies can be brought to the onions to produce more Pikmin. There are many species related to the Bulborb, including Bulblaxes, Bulbears, and Water Dumples. 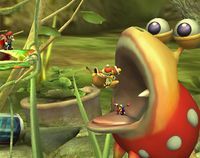 King Dedede and some Pikmin about to be eaten by the Bulborb. A Red Bulborb can appear on the right side of the Distant Planet stage. It stands in place, looking around and acting as an extra platform. However, standing on it is very dangerous, as it may chomp down on any lingering players and carry them off screen, resulting in a one-hit KO. The Bulborb occasionally opens its wide mouth, similarly quickly eating and OHKOing any character who lands in it. In Olimar's Final Smash, End of Day, dusk will fall and Olimar will enter his ship to escape the predators of the planet. When Olimar leaves the stage, Red Bulborbs will constantly attack the players that remain on the field. However, characters like R.O.B. and Pit may be able to escape the furious attacks of the Red Bulborbs by using their up special moves. A creature whose Japanese name translates as "spotted crimson bug-eye." These bulky nocturnal animals have white-and-red-flecked rumps that resemble strawberries. Red bulborbs sleep in the day and wake in the evening to feed on small animals. Several colors of bulborb subspecies have been discovered--their classification is a hot subject for scholars. The Red Bulborb in the background of Garden of Hope. The Red Bulborb keeps its Brawl roles in Distant Planet and End of Day. It can also appear on the left side of Garden of Hope, but does not interact with the fighters. The Bulborb in Smash Run. jumping backwards, rump-first, dealing strong knockback when directly behind it or dealing a weak meteor on the top of the hit. The Bulborb trophy appears in both versions. In Super Smash Bros. for Wii U it is part of the Distant Planet & Indigenous Creatures Trophy Box. These creatures from the Pikmin series have snail-like protruding eyes, huge mouths, and really bad tempers. They're known for snapping at fighters and trying to trample them underfoot. If you see one in a group of enemies, you should try to take it out fast—it'll shoot off and bounce around, hitting other enemies as it goes! These creatures from the Pikmin series have snail-like protruding eyes, huge mouths and really bad tempers. They're known for snapping at fighters and trying to trample them underfoot. If you see one in a group of enemies, you should try to take it out first - it'll shoot off and bounce around, hitting other enemies as it goes! These creatures from the Pikmin series have snaillike protruding eyes, huge mouths, and really bad tempers. Despite their cute appearance, they'll happily gobble up Pikmin! In Smash Bros., they appear on the Garden of Hope stage, wandering around or chasing the poor Pikmin. Thankfully, they don't seem interested in the fighters duking it out. The Red Bulborb returns as part of Olimar's Final Smash, as well as on the Distant Planet and Garden of Hope stages. As a hazard on Distant Planet, it no longer carries fighters off the screen in its mouth. Instead, its bite causes an instant KO to fighters who get too close. Olimar and King Dedede on the Bulborb. A photo taken with a hacked camera showing that the Bulborb never actually leaves the stage, it just walks off-screen. This page was last edited on March 11, 2019, at 21:43.